The wedding veil is one of the oldest wedding traditions, symbolizing modesty, purity, and chastity. In this day and age, however, wearing a veil is not a requirement, which is why it’s so much fun to let your style and personality shine when it comes to selecting your veil. 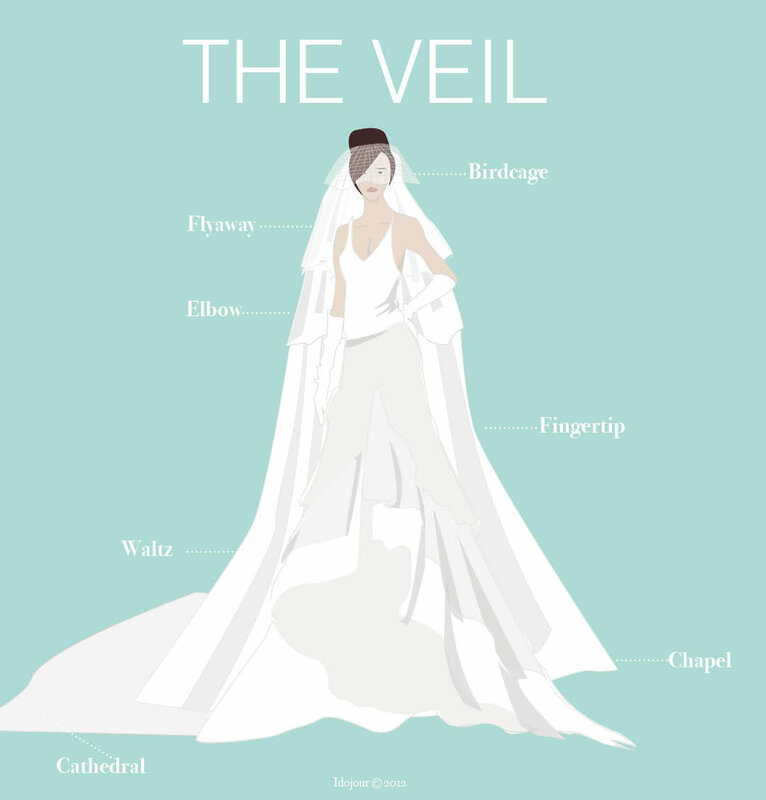 But with so many lengths and styles available, how do you know which veil is the right one for you? Today, we look some options for brides who prefer short and sweet veils. Birdcage veils come in many different styles and can bring a vintage feel to your bridal look. The netting can come down to cover either one or both eyes, your nose, your chin, or even your entire face. It’s entirely a matter of choice; see what looks and feels good for you. 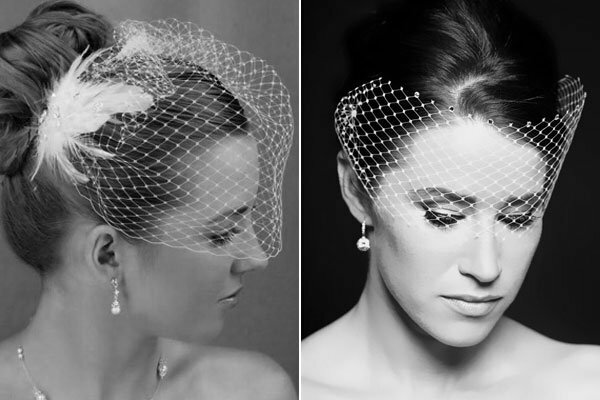 Left to right: Birdcage veil pictured on Wedding Wardrobe; Idojour Serena Birdcage Veil, $99. Dress: Sheaths, fit-and-flares, or short and flirty dresses (think 1950s) with lace and ruffles. Accessories: A feather fascinator or vintage brooch. 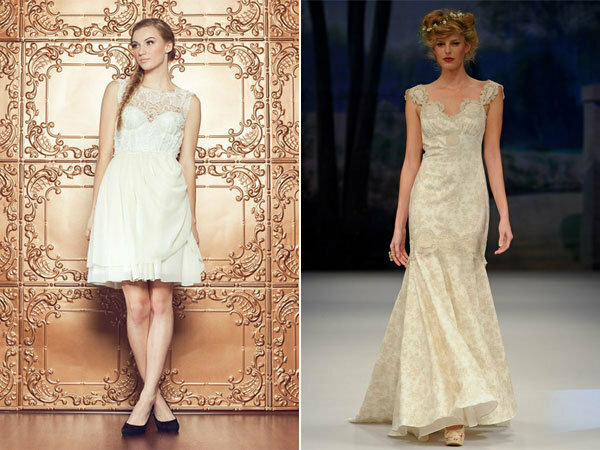 Left to right: Sarah Seven Enrapture Dress, $840; Claire Pettibone Provence Dress. Flyaway veils are wispy and often multi-layered, with the longest layers falling on the shoulders. These veils are usually less than 20″ and are the shortest of the veils that fall behind the head. 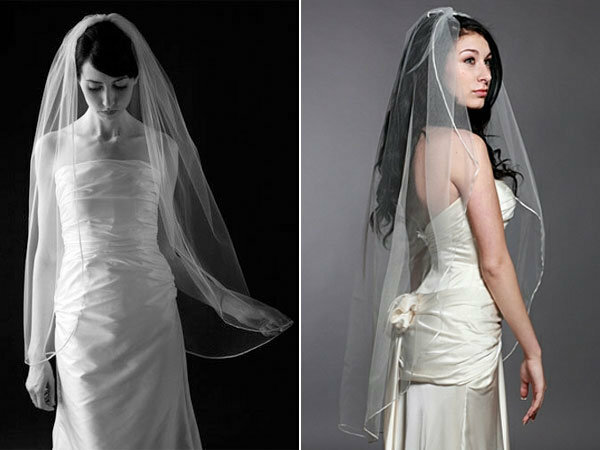 It’s a great pick for a less formal occasion, and it’s perfect for a bride who wants a simple, more understated veil. Dress: Short dresses, sheaths, and gowns with no train. It looks great with more casual fabrics like cottons, shantung, or soft cotton lace. Hair: A loose side braid or a low-key hairdo, like a bun or a French twist. The elbow veil cascades over the shoulders and floats along your upper arms, ending just above the elbow. It can measure anywhere from 28″ to 36″ in length, and it’s a more casual veil alternative. This veil was a favorite of the postwar 1950s. 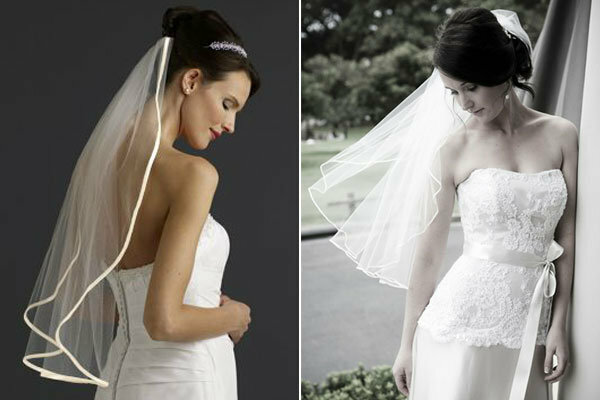 Left to right: David’s Bridal Elbow Length Veil, $79; Wedding Veils Australia, $90.74. Dress: Short casual dresses, long pencil sheath gowns, and gowns with either a short train or no train at all. 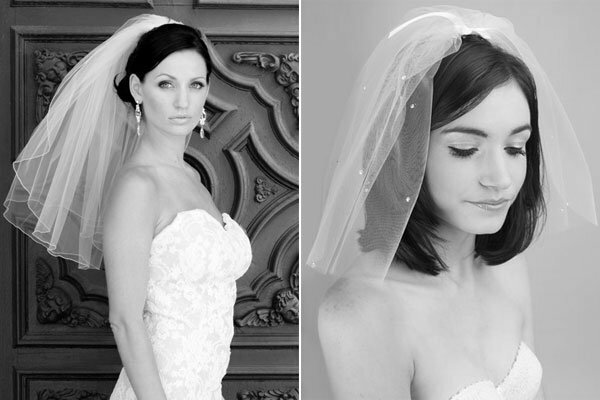 Left to right: Dessy Headband in Matte Satin, $7; After Six Wedding Dress Style 1030 by Dessy, $410. The fingertip veil is meant to float around you like a cape, extending to your outstretched fingertips and typically measuring 48”. It was most popular during the late 1940s and early 1950s. It’s also a modern Royal favorite — Kate Middleton wore a silk tulle fingertip length veil when she married Prince William. 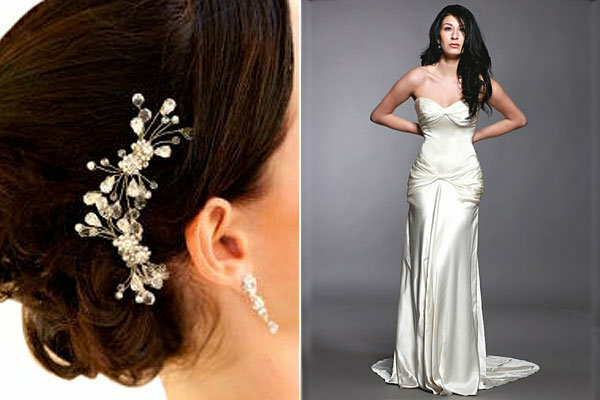 Accessories: A set of embellished hairpins. 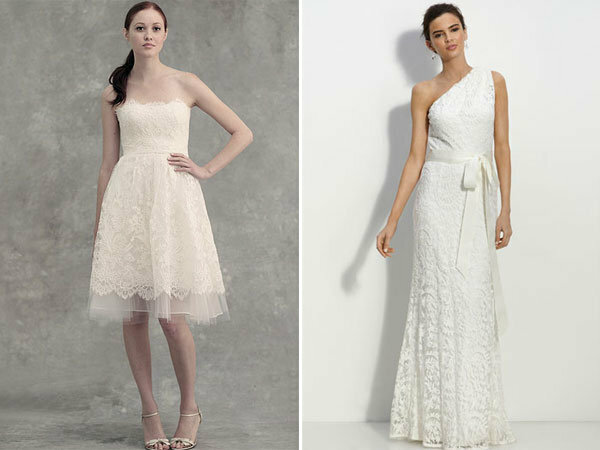 Dress: This style complements just about any long dress style, but it may not be very flattering for petite brides. Stay tuned for part two of our wedding veil series: long and flowy veils!